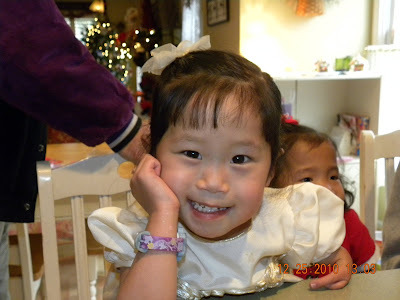 There's this little girl that I have had the privilege of praying for and following for a couple of years now. She used to be known as Lucy, but when she was adopted by her forever family they named her Teresa. Teresa has a heart that is needing a miracle. Her parents have left no stone unturned for her and the doctors are saying that she might not make it through this year. But we know a God that can perform miracles and has a heart for orphans. Please pray for this precious child. We went out to eat last night and while we were waiting another adoptive family walked in (we did not know them, we do not know ALL the adoptive families:). Avery noticed the little Asian girl and said, "Hey! She looks like me!" I was stunned that at the young age of 2 she realized that she looked a little unlike most people. One of the first things the orphanage director told us, in the few English words she knew, was, "She is very clever." When we see or hear of things Avery does that indicate how stinkin' smart she is, we both look at each other and say, "She is very clever." It's a blessing really. We get to make this house our own, AND we got a REALLY good price on it for our family that is not getting smaller, only bigger (not by number just by physical growth, at least for now - I like to tease my mother in law ;). However (which is just a fancy way to say 'but' if you ask Dr. Phil, and I agree), there is some major updating that needs to take place in this new house. Unless saloon doors are back in style, no? What? Isn't the style of 1984 coming back around now? No? Yeah, that's a saloon door on the 'throne room' in the master bathroom. So for a while we'll just be able to look and see if we see any feet under the door instead of politely knocking. Maybe we'll keep it. Have we sold our current house? Nope. Some might say we are putting the cart before the horse. I like to say that we are stepping out in faith. Before. Blecchhkk. Ugly outdated wallpaper, gross carpet. So, here is the finished product. Quite a change, right? MUCH better and simpler and beautiful, right? Makes you want a bathroom like this doesn't it? Party at our house!! WOO HOO! The day was spent in our jammies ALL DAY making some of our most favorite desserts and party foods. No body did any sampling or bowl licking! Especially not me if I were to be totally dishonest. Ethan was in charge of the pigs in a blanket. Avery was in charge of barking orders from the couch, and demanding a sippy cup of juice. Then smooches for all at midnight. Well, it was close to midnight if you think 9pm is close to midnight. I was yawning uncontrollably at 8pm. I think I lasted until 10:30. We are light weights around here!